The world-renowned ZSL London Zoo is home to a large collection of venomous snakes and amphibians. Behind the scenes in the Amphibian & Reptile House, in the snake management area, new safety measures were recently implemented, with the help of Safetread Gritted anti-slip floor sheets and stair nosings. "Working with venomous snakes has the potential to be hazardous and historically we had wooden platforms with limited grip at the back of the reptile tanks that didn't give us much space. The last thing you want is slip and fall with venomous snake on a hook or a in a tube, so we re-developed the area with gritted flat sheets and stair nosing to improve health and safety." "We increased the width of the service area with a new platform, bars and toe boards to access the back of the reptile tanks, and installed anti-slip floor sheets to wooden flooring and anti-slip stair nosing to wooden stairways. During the refit reptiles were moved away and new air condition units were also fitted. The King Cobra, Black Mamba snakes and venomous lizards were rehoused until the platform and non slip flooring area was completed. The anti-slip flooring offers great slip protection we needed when handling the venomous or dangerous snakes and lizards.The floor that we work on usually has a wet surface. 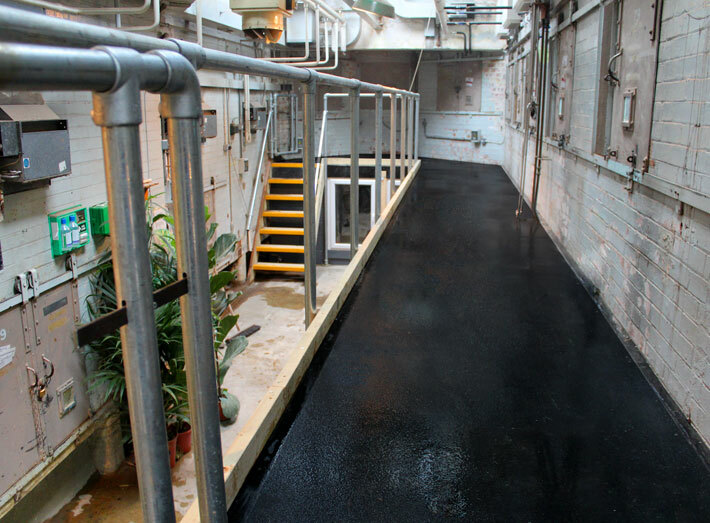 We use hoses to wash down enclosures along with slippery disinfectants so installing the anti-slip floor sheets has greatly improved the area and made the working environment much safer." Anti slip floor sheets are designed to fit to floors, walkways, landings, platforms, a quick and cost effective solution to improving health and safety. Discover more about ZSL London Zoo, visit www.zsl.org. and request a FREE Anti-Slip sample. "The anti-slip flooring offers great slip protection needed when handling venomous or dangerous snakes and lizards. The floor we work on usually has a wet surface. We use hoses to wash down enclosures along with slippery disinfectants, so installing the anti-slip floor sheets has greatly improved the area and made the working environment much safer."